You have to add POST meta data X-Container-Meta-Web-Index for index.html from your Rackspace Cloud Files Control panel. 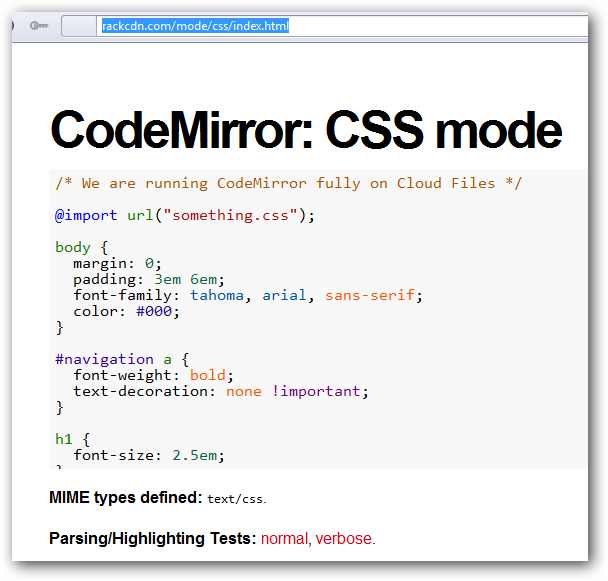 This is basically the Installing Online Code Editing Tool CodeMirror on Rackspace Cloud Files ! Better to say Uploading than Installing. So what you are looking for ? We wrote fuss that never works just like hundreds of other made for money making sites ? Go here for Live Demo of CSS Editor , its Cloud Files. You can do the Parsing/Highlighting Tests too (Red Hyperlinks on that webpage). oh yes, you can actually use the SSL / HTTPS URL too. There are lot of themes, like for Less mode. This Article Has Been Shared 965 Times! Cite this article as: Abhishek Ghosh, "Installing Online Code Editing Tool CodeMirror on Rackspace Cloud Files," in The Customize Windows, October 26, 2012, April 26, 2019, https://thecustomizewindows.com/2012/10/installing-online-code-editing-tool-codemirror-on-rackspace-cloud-files/.